The aptly named SteamBoy is the result of an initiative to make PC gaming portable and easy to accomplish. It is meant to take the Steam Machine one step further, not only putting PC gaming in the living room, but directly into the hands of potential gamers. PC gaming has widely been viewed as an esoteric hobby, but this stereotype is slowly being shown to be vastly outdated and frankly untrue. The efforts of various companies to further expand the PC gaming industry have served to hasten the phasing out of this stereotype. PC gaming over the years has changed from an expensive hobby only pursued by the most die-hard gamers to an accessible, easy to maintain, and popular hobby. In fact, at this rate, PC gaming is on track to dethrone console gaming as the most popular medium of gaming. Having said all of this, we should not put the cart before the horse. This whole concept is prerendered, and at this stage, simply a developed idea. The device resembles the Playstation Vita in that it has a screen between two trackpads. However, the mechanics of this device are vastly different; the goal is to help "bring keyboard-and-mouse levels of control to the gamepad." In terms of technical specifications, the device will house a quad core CPU, 4 GB of RAM, 32 GB of hard drive space, a 5 inch display with a 16:9 aspect ratio, and will feature Wi-Fi and 3G support. The device is meant to play most games currently on the Steam Store, however, it is not going to be able to serve as a replacement for a well built gaming desktop. It is important to note that this handheld gaming device is not being developed by The Valve Corporation. 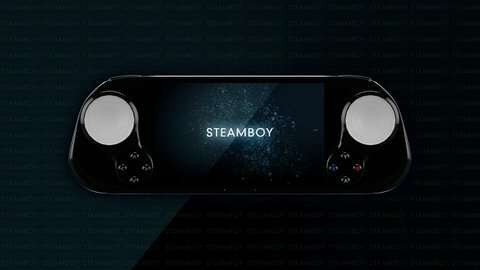 The name is meant to be a mix between "Steam Machine" and "GameBoy," and isn't supposed to allude to any connection with the Valve Corporation. The device will run SteamOS, but affiliation stops there. The device is slated to launch sometime in 2015, but whether this device will actually launch, or if it is just a hoax is yet to be discovered. The SteamBoy and the Steam Machine will both make PC gaming more portable and accessible to the widespread population. Though this device is not yet concrete, the mere idea for this new direction in PC gaming is interesting to say the least. What are your thoughts on this new direction for PC gaming? Do you feel that this expansion has tainted the original idea of PC gaming, or do you welcome the expansion of this industry?